Not to be confused with Identity politics. The Identitarian movement or Identitarianism is a European, North American, Australian and New Zealander far-right and white nationalist movement that originated in France. The identitarians began as a youth movement, with their name derived from the French Nouvelle Droite (New Right) Génération Identitaire (Generation Identity), and the anti-Zionist and National Bolshevik Unité Radicale. Although initially the youth wing of the anti-immigration and nativist Bloc Identitaire, it has taken on its own identity and is largely classified as a separate entity altogether. French essayists such as Renaud Camus, Alain de Benoist and Guillaume Faye are considered the movement's leading intellectual figures. The movement is also a part of the counter-jihad movement, with many adherents espousing the white genocide conspiracy theory and its variant The Great Replacement conspiracy theory. They also support the concept of a "Europe of 100 Flags" which was popularized by Yann Fouéré. The movement has also been described as a part of the global alt-right. In Sweden, the organisation Nordiska förbundet [sv] (active from 2004 to 2010), which founded the online encyclopedia Metapedia in 2006, promoted identitarianism. It mobilised a number of "independent activist groups" similar to their French counterparts, among them Reaktion Östergötland and Identitet Väst, which carried out a number of political actions marked by a certain degree of civil disobedience. The main identitarian youth movement is Génération Identitaire in France, a youth wing of the Bloc Identitaire party. The origin of the Italian chapter Generazione Identitaria dates from 2012. The movement also appeared in Germany and converged with preexisting circles, centered on the magazine Blue Narcissus (Blaue Narzisse [de]) and its founder Felix Menzel [de], a martial artist and former German Karate Team Champion, who according to Gudrun Hentges – who worked for the official Federal Agency for Civic Education – belongs to the "elite of the movement". It became a "registered association" in 2014. Drawing upon thinkers of the Nouvelle Droite and the Conservative Revolutionary movement such as Oswald Spengler, Carl Schmitt or the contemporary Russian Aleksandr Dugin, it played a role in the rise of the PEGIDA marches in 2014/15. The identitarian movement has a close linkage to members of the German New Right, e.g., to its prominent member Götz Kubitschek and his journal Sezession, for which the identitarian speaker Martin Sellner writes. As their symbol, the European Identitarian movement and Generation Identity use a yellow lambda sign, a symbol that was painted on the shields of the Spartan army – popularized by the film 300 – supposedly to commemorate the Battle of Thermopylae of 480 BCE. In August 2016 members of the identitarian movement in Germany scaled the iconic Brandenburg Gate in Berlin and hung a banner in protest at European immigration and perceived Islamisation. Members of the identitarian movement erected a new summit cross in a "provocative" act (as the Süddeutsche Zeitung reported) on the Schafreuter, after the original one had to be removed because of damage by an unknown person. In June 2017 the PayPal donations account of the identitarian "Defend Europe" was locked, and the identitarian account of the bank "Steiermärkische Sparkasse" was closed. Defend Europe crowdfunded more than $178,000 to charter a ship in the Mediterranean. It aimed to ferry any rescued migrants back to Africa, to observe any incursions by other NGO ships into Libyan waters, and to report them to the Libyan coastguard. In the event, the ship chartered by GI suffered an engine failure, and had to be rescued by a ship from one of the NGOs rescuing migrants. In October 2017 key figures of the identitarian movement met in London in efforts to target the United Kingdom, and discussed the founding of a British chapter as a "bridge" to link with radical movements in the US. The United Kingdom and Ireland branch was launched[by whom?] in late October 2017 after a banner was unfurled on Westminster Bridge reading "Defend London, Stop Islamisation". On 9 March 2018, Sellner and his girlfriend Brittany Pettibone were barred from entering the UK because their presence was "not conducive to the public good". Prior the ban, Sellner intended to deliver a speech to the Young Independence party, though they cancelled the event, citing supposed threats of violence from the far-left. Prior to being detained and deported, Sellner intended to deliver his speech at Speakers' Corner in Hyde Park. In June 2018 Tore Rasmussen, a Norwegian activist who had previously been denied entry to the United Kingdom, was working in the Republic of Ireland to establish a local branch of Generation Identity. The founder of the far-right Croatian party Generation of Renovation has stated that it was originally formed in 2017 as that country's version of the alt-right and identitarian movements. Les Identitaires, founded in 2003, is a French identitarian group. Identitäre Bewegung Österreichs is an Austrian identitarian group founded in 2012. The political party Identity Ireland was founded in 2015. Australia has a local presence of the Identitarian movement in the form of an organization known as Identity Australia which describes itself as "a youth-focused identitiarian organisation dedicated to giving European Australians a voice and restoring Australia's European character". The group has also published a manifesto detailing its beliefs. Similarly, New Zealand had hosted the Dominion Movement, which labeled itself as "a grass-roots identitarian activist organization committed to the revitalization of our country and our people: White New Zealanders". The website for the group shutdown alongside New Zealand National Front in the aftermath of the Christchurch mosque shootings. Australia-born Brenton Harrison Tarrant, the perpetrator of the Christchurch mosque shootings in New Zealand was a believer in The Great Replacement conspiracy theory and named his manifesto after it, as well as donating 1,500 euros to Austrian Identitarian leader Martin Sellner of Identitäre Bewegung Österreichs a year prior to the terror attacks. Following an investigation into the potential links between Tarrant and the IBÖ (the Austrian branch of Generation Identity) by then Austrian minister of the interior Herbert Kickl, it was soon discovered that there was no evidence of further contact or connections between the two parties (other than the donation) though the Austrian government is considering dissolving the group. The shooter also donated 2,200 euros to Generation Identitare the French branch of the Generation Identity which has to the government of France to consider the possibility of disbanding the group. Richard B. Spencer identifies himself as a leading member of the American identitarian movement. The now defunct neo-Nazi Traditionalist Youth Network/Traditionalist Worker Party was modeled after the European Identitarian movement, according to the Southern Poverty Law Center and the Anti-Defamation League. Identity Evropa/American Identity Movement in the United States labels itself Identitarian, and is part of the alt-right. Richard Spencer's National Policy Institute is also a white nationalist movement, which advocates a version of identitarianism. The SPLC also reports that the Southern California-based Rise Above Movement "is inspired by identitarian movements in Europe and is trying to bring the philosophies and violent tactics to the United States." On 20 May 2017, two non-commissioned officers with the US Marines were arrested for trespassing after displaying a banner from a building in Graham, North Carolina, during a Confederate Memorial Day event. The banner included the identitarian logo, and the phrase "he who controls the past controls the future", a reference to George Orwell's novel, Nineteen Eighty-Four, along with the acronym YWNRU, or "you will not replace us". The Marine Corps denounced the behavior and investigated the incident. A marine spokesperson commented to local news “Of course we condemn this type of behavior ... we condemn any type of behavior that is not congruent with our values or that is illegal.” Both men plead guilty to trespassing. One received military administrative punishment. The other was discharged from the corps. The Canadian organization IDCanada was originally formed in 2014 as Generation Identity Canada, and rebranded in 2017 after the Charlottesville riots. The organization has distributed propaganda in Hamilton, Ontario, and near McGill University in Montreal. The movement has been described as being part of the global alt-right, or as the European counterpart of the American alt-right. Hope Not Hate (HNH) has described identitarianism and the alt-right as "ostensibly separate" in origin, but with "huge areas of ideological crossover". Many white nationalists and alt-right leaders have described themselves as identitarians, and according to HNH, American alt-right influence is evident in European identitarian groups and events, forming an amalgamated "International Alternative Right". Figures within the Identitarian movements and alt-right often cite Nouvelle Droite founder Alain de Benoist as an influence. 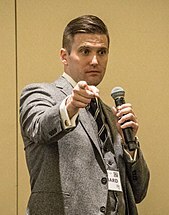 De Benoist rejects any alt-right affiliation, although he has worked with Richard B. Spencer, and once spoke at Spencer's National Policy Institute. As Benoist stated, "Maybe people consider me their spiritual father, but I don’t consider them my spiritual sons". According to Christoph Gurk of Bayerischer Rundfunk, one of the goals of identitarianism is to make racism modern and fashionable. Austrian identitarians invited radical right-wing groups from across Europe, including several neo-Nazis groups, to participate in an anti-immigration march, according to Anna Thalhammer of Die Presse. There has also been Identitarian collaboration with the white nationalist activist Tomislav Sunić. The investigation by political scientist Gudrun Hentges came to the conclusion that the identitarian movement is ideologically situated between the French National Front, the Nouvelle Droite, and neo-Nazism. ^ a b Nicht links, nicht rechts – nur national, Volker Weiß, Die Zeit, 21 March 2013. ^ "Your Handy Field Guide to the Many Factions of the Far Right, From the Proud Boys to Identity Evropa". Wired. Retrieved 17 October 2017. ^ a b c "American Racists Work to Spread 'Identitarian' Ideology". Hatewatch. Southern Poverty Law Center. 12 October 2015. Retrieved 17 October 2017. ^ Knight, Ben (20 March 2017). "German right-wing Identitarians 'becoming radicalized'". DW.COM. Deutsche Welle. Retrieved 17 October 2017. "How "identitarian" politics is changing Europe". The Economist. Retrieved 2 August 2018. "Meet the identitarians, Europe's 'new right'". Public Radio International. Retrieved 2 August 2018. (www.dw.com), Deutsche Welle. "Identitarian movement – Germany's 'new right' hipsters | DW | 23.06.2017". DW.COM. Retrieved 2 August 2018. "Austria indicts leaders of far-right Identitarian Movement". Fox News. Associated Press. 14 May 2018. Retrieved 18 August 2018. Strickland, Patrick (22 May 2018). "Austria cracks down on far-right Identitarian Movement". Al Jazeera. Retrieved 18 August 2018. ^ "Antifa, alt-right, white supremacy: A glossary of terms to know". The Tennessean. Retrieved 20 October 2017. Identitarianism: A white nationalist movement with roots in Europe, popularized in the United States in the last couple years through groups like Identity Evropa fliering college campuses. ^ "Key bridge-building conference for U.S. and European Racists Slated for Hungary Oct. 3-5". Southern Poverty Law Center. Retrieved 23 October 2017. ^ Lee, Benjamin (21 October 2016). "Why we fight: Understanding the counter-jihad movement" (PDF). Religion Compass. 10 (10): 257–65. doi:10.1111/rec3.12208. ^ a b Dearden, Lizzie (22 October 2017). "Far-right extremists targeting UK as they 'weaponise internet culture'". The Independent. Retrieved 16 November 2017. Members of the ethno-nationalist Identitarian movement met in London over the weekend with the aim of starting a new British branch. ^ Boon, Jacob. "Matt Whitman stands by white supremacists' message". The Coast Halifax. Retrieved 17 March 2018. ^ "Occupy le mosque: France's new far-right nativism". Special Broadcasting Service. Retrieved 23 October 2017. "A European alt-right group wants to take to the sea to stop rescuers from saving migrants". Vox. Retrieved 22 October 2017. Huetlin, Josephine (15 October 2017). "Europe's 'Alt-Right' Back From the Dead With Fresh Young Face". The Daily Beast. Retrieved 17 October 2017. Crowcroft, Orlando (3 March 2017). "Generation Identity: How the European alt-right is planning a British invasion". International Business Times UK. Retrieved 22 October 2017. ^ "Den nya nationalhögern", Christoph Andersson. 10/03/2006, Dagens Nyheter. ^ L’estrema destra europea vuole bloccare le navi delle Ong con un crowdfunding (in Italian), Di Leonardo Bianchi, 18 May 2017, Vice News. ^ Hentges, Gudrun; Kökgiran, Gürcan; Nottbohm, Kristina (2014). "Die Identitäre Bewegung Deutschland (IBD) – Bewegung oder virtuelles Phänomen?" (PDF). Forschungsjournal Soziale Bewegungen (in German). 27 (supplement to issue 4). Retrieved 8 July 2017. ^ Reg-No. : VR 3135, District Court Paderborn, cf: Impressum on the website. ^ Bruns, Julian; Glösel, Kathrin; Strobl, Natascha (2014). Die Identitären: Handbuch zur Jugendbewegung der Neuen Rechten in Europa (in German). Münster, Germany: Unrast. ISBN 978-3897715493. ^ "German rightists scale Brandenburg Gate to protest immigration". Reuters. 27 August 2016 – via Reuters. ^ Sebald, Christian (15 September 2016). "Rechtsextreme errichten neues Gipfelkreuz am Schafreuter" [Right-wing extremists erect new summit cross on the Schafreuter]. Süddeutsche Zeitung (in German). Retrieved 17 August 2017. ^ Bonvalot, Michael (22 June 2017) Weitere Bank kündigt Spendenkonto der Identitären (in German), Die Zeit. ^ "Full of ship: Behind Generation Identity's high seas publicity stunt". Southern Poverty Law Center. Retrieved 18 March 2018. ^ "Far-right group are sending a boat full of activists to Mediterranean to send refugees 'back to Africa'". The Independent. 13 July 2017. Retrieved 15 July 2017. ^ Henley, Jon (11 August 2017). "Refugee rescue ship sails to aid of anti-migrant activists stranded in Med". The Guardian. Retrieved 22 May 2018. ^ Dearden, Lizzie (9 November 2017). "Far-right group is sending UK recruits to military-style training camps in Europe". The Independent. ^ "Why 3 anti-Islam activists were refused entry to the UK". BBC News. 14 March 2018. Retrieved 31 March 2018. ^ "Ukip youth wing say they've cancelled conference over 'Hard Left threat'". The Independent. 3 September 2017. Retrieved 31 March 2018. ^ CNN, Gianluca Mezzofiore. "Three far-right activists and YouTubers denied entry to the UK". CNN. Retrieved 31 March 2018. ^ The Times, Aaron Rogan. "Far-right activist barred by UK is recruiting in Dublin". The Times. Retrieved 27 June 2018. ^ Strickland, Patrick (16 March 2018). "Croatia's 'alt-right': A dangerous group on the margins". al Jazeera. Retrieved 1 July 2018. ^ "Manifesto Identity Australia". Retrieved 6 April 2019. ^ "Identity Australia". Retrieved 6 April 2019. ^ "Christchurch terror attack: Anti-immigration websites taken down after shootings". Radio New Zealand. 16 March 2019. Retrieved 6 April 2019. ^ "Suspected New Zealand attacker donated to Austrian far-right group, officials say". NBC News. Reuters. 27 March 2019. Retrieved 27 March 2019. ^ "Christchurch-Verdächtiger offenbar ohne Kontakte nach Österreich". Luzerner Zeitung (in German). Retrieved 2 April 2019. ^ jungefreiheit.de. "Kickl: Christchurch-Attentäter ohne Kontakte nach Österreich". JUNGE FREIHEIT (in German). Retrieved 2 April 2019. ^ "FPÖ-Innenminister Kickl: Christchurch-Attentäter wohl ohne Kontakte nach Österreich" (in German). ISSN 0174-4909. Retrieved 2 April 2019. ^ "Christchurch mosque shootings: Accused gunman donated $3650 to far-right French group Generation Identity". New Zealand Herald. 5 April 2019. Retrieved 6 April 2019. ^ Maya Oppenheim (23 January 2017). "Alt-right leader Richard Spencer worries getting punched will become 'meme to end all memes'". The Independent. Retrieved 25 February 2017. ^ "Meet the New Wave of Extremists Gearing Up for the 2016 Elections". SPLCenter.org. 19 October 2015. Retrieved 31 August 2017. ^ "Traditionalist Youth Network". Anti-Defamation League. ^ Gelin, Martin (14 November 2013). "White flight". Slate. Retrieved 11 May 2015. ^ Weill, Kelly (14 March 2018). "Neo-Nazi Group Implodes Over Love Triangle Turned Trailer Brawl". Retrieved 27 March 2019. ^ "White Nationalist Group Identity Evropa Rebrands Following Private Chat Leaks, Launches 'American Identity Movement'". 12 March 2019. Retrieved 27 March 2019. ^ Janicello, Natalie (27 May 2017). "Corps condemns Marines' behavior". The Times-News. ^ Weill, Kelly (30 January 2017). "Two Marines Arrested at a Confederate Rally Are Back on Duty". The Daily Beast. Retrieved 3 July 2017. ^ Groves, Isaac (10 October 2017). "Marines plead guilty to trespassing at Confederate rally". Jacksonville Daily News. Retrieved 11 October 2018. ^ Curtis, Christopher; Carranco, Shannon; Milton, Jon (14 May 2018). "Alt-right in Montreal: How Charlottesville exposes the key players in the local white nationalist movement". Montreal Gazette. Retrieved 27 March 2019. ^ Tipple, Paul (16 January 2019). "Alt-right posters plastered on transit shelters in West Hamilton". Global News. Retrieved 27 March 2019. ^ Astier, Henri (5 April 2017). "Patriot power: How France's alt-right seeks to sway election". BBC News. ^ "Meet the IB, Europe's version of America's alt-right". The Economist. 12 November 2016. ^ a b c "HNH explains... the Identitarian movement and the alt-right". HOPE not hate. 31 October 2017. ^ a b c Feder, J. Lester; Buet, Pierre (26 December 2017). "They Wanted To Be A Better Class Of White Nationalists. They Claimed This Man As Their Father". BuzzFeed News. Retrieved 1 July 2018. ^ Williams, Thomas Chatterton. "The French Origins of "You Will Not Replace Us"". The New Yorker (4 December 2017). Retrieved 1 July 2018. ^ Christoph Gurk: Diese Gruppen machen den Rassismus hip (Interview with Alexander Häusler). Bayern plus of the Bayerischer Rundfunk, 17 May 2013. ^ Das Netzwerk der Identitären mit der FPÖ, Anna Thalhammer, Die Presse, 10 June 2016. ^ Tomislav Sunić zu Gast bei "Identitären", DÖW, February 2016. ^ Gudrun Hentges, Gürcan Kökgiran, Kristina Nottbohm: Die Identitäre Bewegung Deutschland (IBD) – Bewegung oder virtuelles Phänomen? In: Forschungsjournal Soziale Bewegungen [de] 3/2014, p. 19. Teitelbaum, Benjamin R. (2017). Lions of the North: Sounds of the New Nordic Radical Nationalism. New York: Oxford University Press. ISBN 978-0190212599. Virchow, Fabian (2015). "The 'Identitarian Movement': What Kind of Identity? Is it Really a Movement?". In Simpson, Patricia Anne; Druxes, Helga (eds.). Digital Media Strategies of the Far Right in Europe and the United States. Lanham, Maryland: Lexington Books. pp. 177–90. ISBN 978-0739198810. Vejvodová, Petra (September 2014). The Identitarian Movement – renewed idea of alternative Europe (PDF). ECPR General Conference. Masaryk University, Brno: Department of Political Science, Faculty of Social Studies. Retrieved 10 May 2017. Somaskanda, Sumi (23 June 2017). "Identitarian movement – Germany's 'new right' hipsters". Deutsche Welle.